SRT files are a simple text files that can be edited in any text editor. They are used to display subtitles in supported video players and subtitle creation programs. Text editor examples include Notepad, TextEdit and Notepad++. 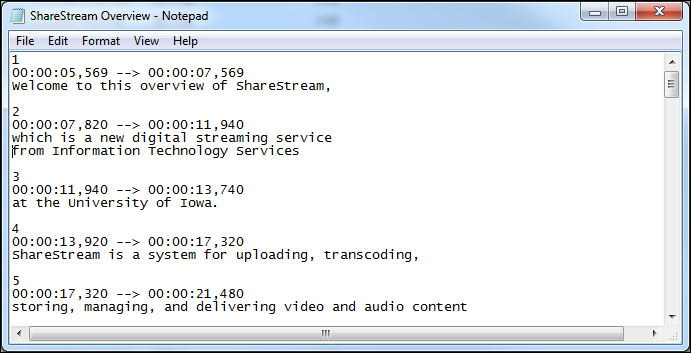 The format used to timestamp the subtitles is hours:minutes:seconds,milliseconds, with the milliseconds field precise to three decimal places. More information on SRT files. A .srt file consists of four mandatory parts. A number showing the subtitle's order in the series, starting with 1. The time that the subtitle starts , followed by --> and the time it ends. A blank line to show where the next subtitle begins. Here are instructions on how to create .srt files using YouTube or Camtasia. No more than 2 lines of text per caption. Limit yourself to 32 characters per line or approximately 4-8 words. Left justified and in the middle of the screen if at all possible. Punctuation should be used to make meanings clear. Spell check, spell check, spell check! Nothing looks less professional than misspellings in captions. Match what the speakers say exactly. However, stylistically, you may want to make a determination if you are going to code pause markers like "um" and "ah" or if you want to write informal speech like "gonna" as "going to" or keep it as "gonna," etc. In captioning entertainment focused media, for example, such stylistic markers may be more important than in captioning academic content. Captions should not stay on screen during long periods of silence. They should match the timing of the speaking unless the speaking is clipped making reading difficult. If you know what kind of music is playing such as piano, pop, etc: [ Pop music playing ]. If there is music with no lyrics playing for a long time, you can input ♪ and leave it on the screen after saying there is music playing with no lyrics. If there are lyrics to music, input and sync the lyrics with a music note before and at the end of each line. If there is a long period of silence in between clips, it may be helpful to input [Silence]. 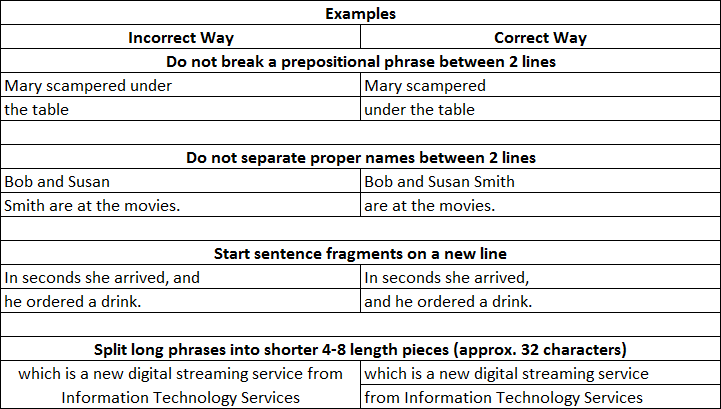 More information on Captioning can be found on the DCMP Captioning Key! website. Here is the University of Iowa's Web Accessibility Fact Sheet.